$85.805 thousand on 3 screens. Straying from his usual style of wacky broad comedy, Jack Black goes for something darker via 2012’s Bernie. 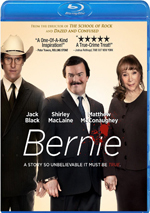 Based on a true story, the film focuses on Bernie Tiede (Black), an assistant funeral director in small town Texas. A much-loved fixture in his location, Bernie gets to know elderly widow Marjorie Nugent (Shirley MacLaine) after the death of her husband. Bernie loves to cozy up with the older women after their husbands pass, but Marjorie proves to be a more difficult case. As loathed by the locals as Bernie is loved, Marjorie initially resists his overtures. However, eventually Bernie manages to break the ice and the pair become inseparable. Eventually Marjorie becomes demanding and clingy, which wears on Bernie. His response? To kill the widow. This leads to an investigation led by local DA Danny Buck Davidson (Matthew McConaughey) and a trial. While Bernie doesn’t use traditional narration, it goes down a similar path, as the majority of the film’s dialogue comes from “interviews” with the Carthage townsfolk. This acts as a way to make the story less about Bernie and more about the locals, which I understand is intentional but I find it to be ineffective. That’s because the approach neuters an intriguing story. Is it a revelation that small towns tend to be filled with gossipy people too preoccupied with the lives of their neighbors? No, and that’s not a particularly fresh subject for a movie. It also seems like an odd way to approach a much more interesting topic. I always view “based on a true story” with a wary eye, and a cursory investigation of the real Tiede tale shows that Bernie takes many liberties. Nonetheless, the core remains a solid basis for a good movie told in a more traditional way – why muck that up with the never-ending “Greek chorus” moments? I don’t know, but I do feel these moments don’t work. As I said, most of the film’s lines/information come from the townsfolk, and that technique ensures that we never really get sucked into the story. The approach causes an alienating effect; we always feel outside the narrative and can’t invest much in Bernie or anyone else. Again, I suspect this was intentional. It puts the emphasis on the gossipy side of things and doesn’t emphasize the “reality” involved. We’re mostly left with a rumor/innuendo version of Bernie and his life. Perhaps I wouldn’t mind the approach if I thought it worked. Unfortunately, I just don’t feel that the format suits the material, and the result tends to fizzle. Bernie keeps us mildly interested across its 99 minutes but it doesn’t go farther than that. Bernie appears in an aspect ratio of approximately 1.85:1 on this Blu-Ray Disc. Overall, this was a positive image. Virtually no softness interfered with the presentation. Across the board, the movie displayed solid clarity and delineation. Jagged edges and moiré effects failed to appear, and edge haloes remained absent. Print flaws also stayed away from this clean image. In terms of palette, Bernie went with a golden tint typical of this sort of effort. Within that choice, the hues were fine and full. Blacks showed good depth, while low-light shots boasted nice clarity. No issues arose in this appealing presentation. Don’t expect much more than a standard (dark) comedy mix from the film’s Dolby TrueHD 5.1 soundtrack. Community and church scenes gave us a decent sense of place, but that was about it. The audio tended to be pretty restrained, so we didn’t get a lot of involvement and activity. This was fine for a movie of this sort, however, so the low-key soundfield wasn’t a detriment. We get a smattering of extras here, highlighted by three featurettes. Amazing Grace runs seven minutes, 16 seconds and includes comments from director/co-producer/co-writer Richard Linklater, choreographer Robin Lewis, Zach Theater artistic director Dave Steakley, producer Ginger Sledge, composer Graham Reynolds, and actors Jack Black and Shirley MacLaine. “Grace” looks at the lead character and Black’s performance. A few decent behind the scenes shots appear, but not much useful information arrives in this Black-glorifying puff piece. In the nine-minute, 27-second True Story to Film, we hear from Linklater, Black, MacLaine, co-writer Skip Hollandsworth, and actor Matthew McConaughey. We learn about the project’s evolution, aspects of the story and characters, and cast and performances. “Film” delivers more substance than the lightweight “Grace”, but it’s still not especially meaty. Still, at least it gives us a smattering of good notes. The Gossips goes for 12 minutes, 59 seconds and offers info from Linklater, funeral home director Bill Pennington and actor Sonny Davis. This piece looks at the “Greek chorus” found in the film; it usually focuses on the extemporaneous chats that comprised their audition tapes. These are moderately interesting to see. 11 Deleted Scenes occupy a total of 10 minutes, 44 seconds. These tend to consist of extensions to existing sequences or minor tidbits. Nothing notable appears here. The disc opens with ads for A Little Bit of Heaven, Rampart, Intruders and Red Lights. These also appear under Previews along with the trailer for Bernie. With Bernie, we get a juicy tale told in an off-putting manner. The use of a “Greek chorus” as narration distances the viewer from the story and makes it less effective. The Blu-ray provides excellent visuals, acceptable audio and a few supplements. The film remains watchable but fails to elevate above that level.